First it was trans fats, then it was calorie labeling, and now the next big hot topic to emerge in the world of nutrition is sodium consumption. That's right, table salt. That innocent one half of a pair that sit on most dinner tables. But it's not that salt shaker's fault! 75-80% of the sodium we consume is in the form of processed foods. The remainder comes from salt added to our diets due to cooking or added at the dinner table. 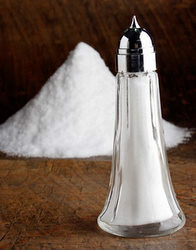 While the salt shaker may be a bad habit for some, it doesn't seem to be the true contributer to our nation-wide problem. Sodium both increases palatability and shelf life, so we've seen it slowly creep into a lot of our food supply more and more... Not to mention the fact that it's a lot cheaper than using traditional spices for the food companies. I don't want to place the blame on the food companies though. It has been the collective effort of consumer demand, food technology, globalization of the food economy, and their need to meet the bottom line that has driven this trend. Salt is becoming a buzz issue because when we have an excess of sodium in our bodies it causes our hearts to have to work harder to get the blood through our system. This leads to increased blood pressure, which is directly related to heart disease and stroke. Heart disease and stroke are the leading causes of death in the United States. They account for millions of deaths, billions of health care dollars spent, and countless co-morbidities (such as diabetes or glaucoma). Sodium consumption is a public health problem that is beginning to emerge as an option to combat these chronic diseases. The National Sodium Reduction Initiative is a program that is in it's very beginning phases. New York City has taken the reins on this issue and partnered with many governments and organizations across the nation. They are in the beginning phases of assessing the right approach, but look to reduce sodium intake in New Yorkers by 20% over the next five years. This will be done by partnering with the food industry and working to change the environment of options available to New Yorkers. While the NSRI is initiative is voluntary (so too were trans fats and menu calorie posting once), the focus is to help food companies reduce sodium across product lines instead of focusing on any given percentage in all foods. The top foods that contribute sodium to the diet include sauces (check out the labels of the tomato and teriyaki sauces you find yourself purchasing), canned goods, condiments, soups, prepared mixes, and frozen meals or meal replacement options. I encourage you to check out the sodium level on some of the foods you're eating! Are you surprised to read this? Not surprised? Do you have any opinion on how we best proceed to solve this problem across the country?